Most commonly paraesophageal Hernia is known as the type II hernia. In this type of the hernia patient stomach actually herniates. The esophagus actually gets out of the fiber wall of the skin. The hernia appears right along the side of the esophagus. There is a gastroesophageal junction, in this type of the hernia the junction’s remains intact just beneath the hiatus. The problem is with the stomach that comes out in front and appears in the chest region. The problem can cause other complications inside the body. This hernia is not considered as the common type of the hernia. In simplest of the words, the Paraesophageal hernia can be defined as the type of problem in which the internal esophagus is pushed out of the body through the wall that actually separates the chest and the abdomen region of the human body. Patients suffering from the issue will have the esophagus that bulges out from one side or the other. The opening is mostly from the side of the esophagus. In this particular type of the hernia, the size of the hernia is usually small, but it can get bigger if not properly treated. This typically hernia is actually sliding because it is right next to the esophagus. There are various symptoms that can represent the hernia issue. In paraesophageal hernia, there is a small sliding hernia that can be seen. Such type of the hernia may not cause any type of the issue. Other than that there are other issues that can also be seen, for example heartburn and Regurgitation is observed most of the time. A patient can have difficulty is swallowing as well. Chest pain is often observed with all the other symptoms. Patients with the hernia are also anemic as well. Other than that most of the patients suffering from the same problem can also chronic cough. According to the medical research, there is no specific cause of the paraesophageal hernia. The problem can be at any stage, adults and the children can have the same sort of the problem. 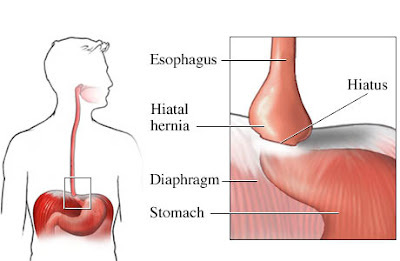 Some doctors are convinced that this typical type of the hernia can be because of weakening of the muscles; these are diaphragm muscles that provide support to the esophagus. Due to the increased intra-abdominal pressure the problem can also arise. In females most of the time, the problem can be due to pregnancy because due to stretch of the muscles, there might be additional pressure that can cause the issue. Just like the other treatments there is a treatment available for this type of the hernia. The anatomy is actually disturbed in such type of the issue. There is a surgery suggested to deal with the paraesophageal hernia. During the surgery the crural opening of the diaphragm is repaired. The hernia is actually reduced and then the surgery is done. There are two methods that can be used as the treatment. First method is called thoracotomy and the other method is laparotomy. In laparotomy there is an incision done by the surgeons. In thoracotomy the incision in the chest is actually done.